Open to other ‘Friends Groups’. Sat 23/10/2010 11ish – 3ish Griffin Wood Weeding of new hedgerow; litter; replacement of broken tree straps; removal of tree guards from dead trees in Dog Kennel Plantation; identification of sites for transplanting trees from nursery. If you would like more details of any of the above events please contact us, or why not come along and say hello. 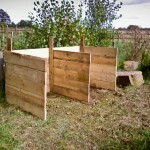 Following on from the composting course held in May, the Friends of Griffin Wood decided to build their own Compost Bin. 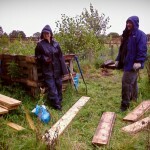 Ste’s fishing umbrella helped with the heavy rain and the old fashioned hand drill showed off the failing power tools.